Hello. I just downloaded Opera and I don't seem to have any option for the included VPN in Opera. 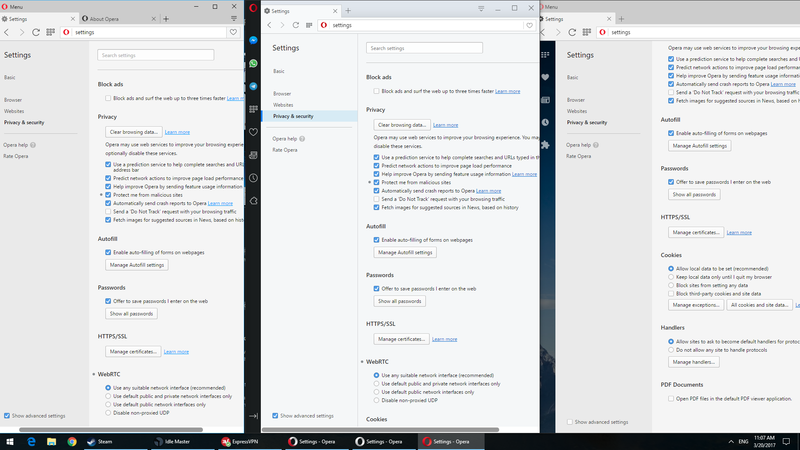 I downloaded three versions of Opera - stable, beta, and developer, to see if there was any difference, but it seems that the option is always missing for some reason. I checked every single setting option and didn't find anything, and I took a screenshot with all of the browsers open with where I'm pretty sure the setting should be. Why is it not there? I'm running Windows 10. In the picture, I do have a VPN running, but I tried both with an without to see if it was my country (China) somehow causing an issue, but it didn't make a difference. Why is the option not there? The VPN is not included for people from China because the Chinese government's blocking efforts prevent it from working. Maybe some of the VPN extensions at Opera Addons or Chrome Store work for you. There are many extensions for VPN. When i need it ZenMate VPN.